This is the upper part of Dunsinane Sheen Waterfall taken from the top of the bridge. 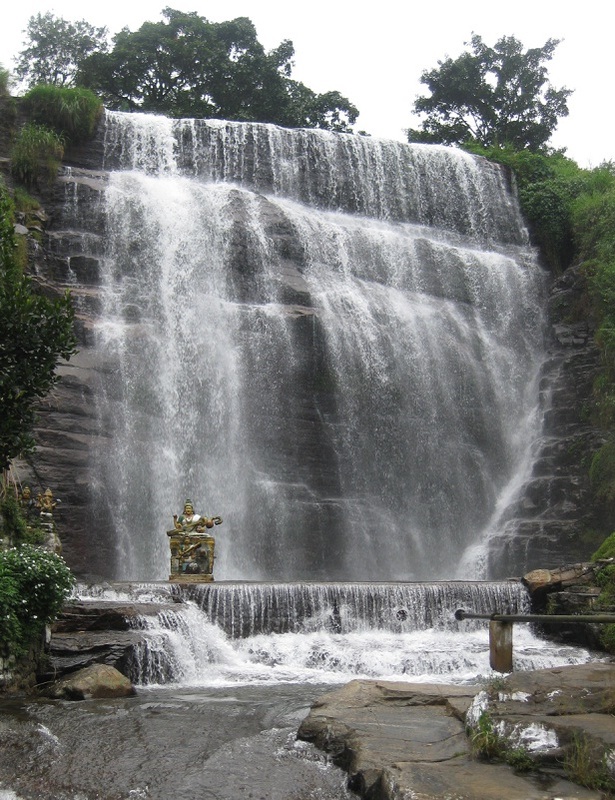 There is a Hindu temple (Kovil) built just adjacent to the falls and the most interesting part is the statue of Goddess Sarasvathi, in front of the falls. The small but intricate statue brings a sacred value to this awesome scenery. Anyone who is interested to know how this waterfall got its Scottish name, you may refer to this interesting article. You are one of the Mr. Waterfall. This waterfall is so beautiful that I can understand why it is a sacred place. The statue of the goddess is beautiful (as is the waterfall). Thanks for the links to some interesting historical facts. I usually do not like man made items in a scenic place, but this one I really like. i am like you, i usually do not want to see anything man made in a natural scenic place, but understanding the meaning of the statue, it makes for a greater appreciation why is it there. I guess you have been traveling a lot lately. Lovely picture k. The idol in front adds so much mystique to the scene. How long ago was this? Did you happen to step in to the superintendent's bungalow? Looking forward for more. Thanks KP, This is how I remember it, of course with a little less water. History lesson was good too. Sometimes I wonder, when I say Magerata, which one. So far I have three such. Wonder what did those Scots think. The waterfall gets more amazing as you get closer. The majesty and power is overwhelming.. Nature, to me looks best in its raw form. I agree with silent moments. Nevertheless still it looks awesome! Thanks for taking us to these amazing places K.
Thanks Frieda. I also liked that article a lot. I did a bit of travelling after sometime with the little baby. This was taken last week. No I did n’t see any bungalow close by. Is it the one belongs to your friend? I think those Scots lived a super luxurious life in the hill country, you can imagine that when you look at all the bungalows still exist there. I think you must have visited here during dry season. Yep, nature is at its best when it is on its own, but it is very difficult to see such places now, so the seamless association of man made work and the environment is something we should look for. Yep it was such a great place! Looks very pretty. And what an interesting place to put up a shrine! I enjoyed the last link too. What an enchanted place. Gorgeous! Wow.. the statue stands out so well against the fall's backdrop. Quite an inspiring and breathtaking sight. Yes, this is a super location and I'm glad i came this way to picture this. The falls has a mystifying beauty in it and also the surrounding is really amazing. The statue is in a great location. The image with its watery background is really nice. The article was fascinating! And the waterfall is beautiful. When we visit SL again, I am going to seek out more waterfalls.